The acceleration toward the networked society is beginning to reshape television. At NAB 2015, a supersession panel comprising executives from Liberty Global, CBS Interactive, Net2TV and Ericsson looked at how the road to TV 2020 might unfold. In this interview with Simon Frost, Head of Communications Marketing for Ericsson, we discuss some of the highlights of the discussion. Mr. Frost kicks off the discussion with a quick review of some key predictions that Ericsson has made. For example, he states that 50% of television consumption will be on demand by 2020, and that 55% of mobile data will be video in the same timeframe. Bob Greene of Liberty Global stated that DOCSIS 3.1, which provides 1 Gbps broadband connections to the home, would be completely rolled out in Liberty’s network by 2020. He also said that WiFi hot spots would also blanket Liberty’s network footprint within 5 years. Tom Morgan of Net2TV talked about how shows online can be stitched together from a sequences of short segments. Leveraging information about the viewers, this allows the show to be customized in real time to “program to the network of 1.” For example, if someone is watching a show by Sports Illustrated, the swimsuit segment could be substituted for something less risqué if a child is watching. Jeff Shultz of CBS Intereactive talked about the pieces that were coming together to help solve the discoverability issues with content online. He said that more show metadata would be combined with location, social, and business data to help viewers find the best content to watch. 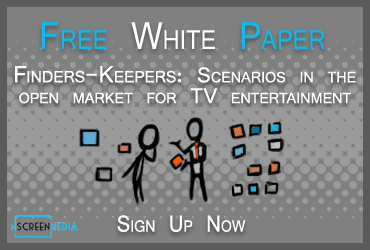 nScreenMedia has just released a new free white paper on precisely this topic. When discussing if HBO had the right strategy for 2020, Mr. Shultz said he thought competition with Netflix hadn’t motivate HBO to go direct online, he thought Netflix liberated HBO to take on the OTT opportunity. There is lots more information in the short video interview. As well, watch out for NAB to publish the video of the full Supersession online soon. The video is activated using a new tool from Vinja Video. You can access different sections of the video by clicking on the chapters listed below it. Related web material can be obtained by clicking on the icons to the right of the chapter listing. Finally, if you like a particular section and want to tweet, just click on the Twitter icon to the right of the channel title.